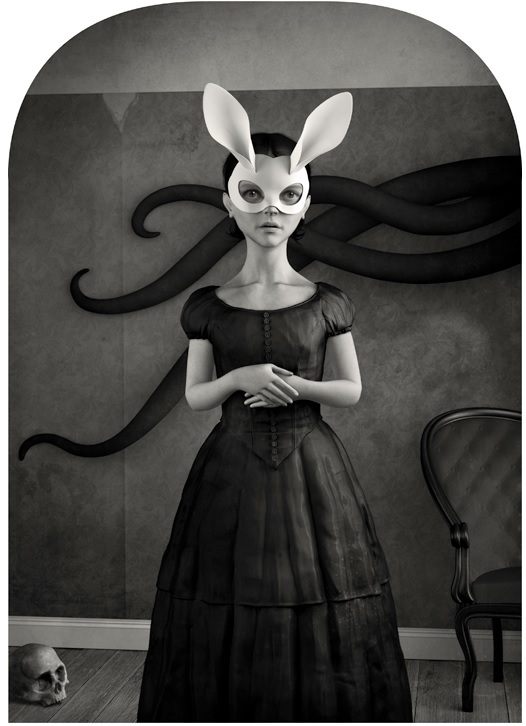 Archival Pigment Print on Hahnemuhle Cotton paper, signed and numbered / Edition of 20. Image size: 47,3 x 31,9 cm / 18.6" x 12.5" | framed: 60 x 45 cm / 23.6" x 17.7"
Image size: 14 x 18,5 cm / 5.5" x 7,3" | framed: 18 x 24 cm / 7.1" x 9.4"
Acrylic Paint on Polyamide 3D Printed Sculpture w/Antique Glass Dome, base of Rosewood Veneer & Marquetry Panel/ Edition of 3. Sculpture size: 38 cm / 15" | w/Antique Glass Dome: 51 cm / 20"
Acrylic Paint on Polyamide 3D Printed Sculpture w/Antique Glass Dome/ Edition of 3. 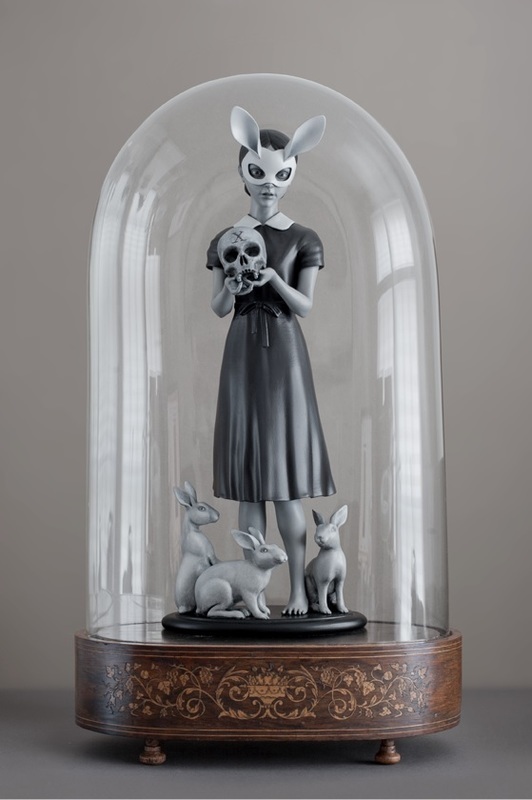 Sculpture size: 40 cm / 15.7" | w/Antique Glass Dome: 49 cm / 19"
Acrylic Paint on Polyamide 3D Printed Sculpture & transparent plastic w/Antique Glass Dome/ Edition of 3. Sculpture size: 39,5 cm / 15.6" | w/Antique Glass Dome: 51 cm / 20"
about his work is that he perfectly reflects the essence of art, namely the generation of emotional responses. 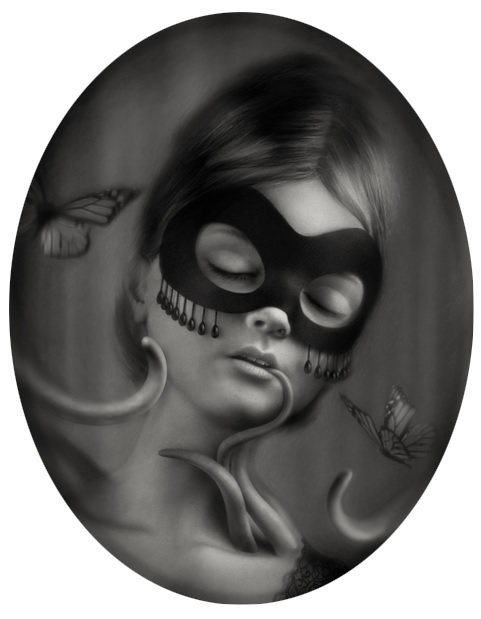 His work evokes a mystical fascination that almost has a hypnotic effect on the audience. a quest for the search of his inspiration. 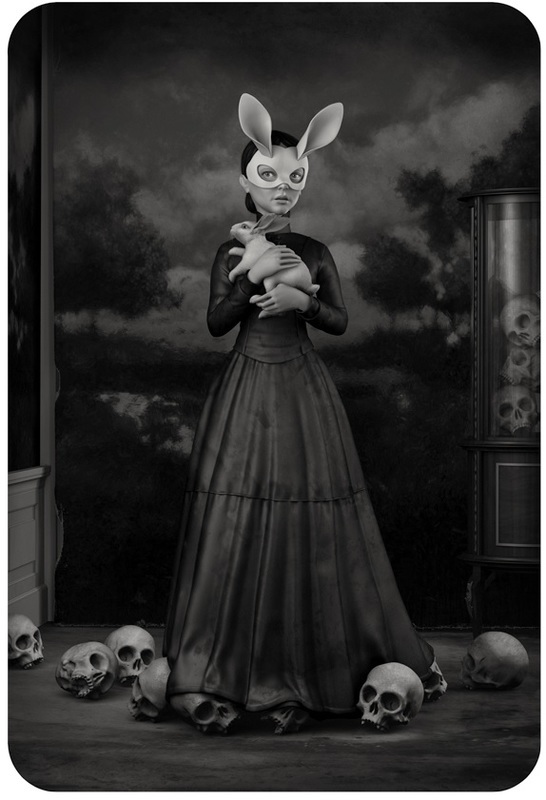 An extraterrestrial experience at an early age would reportedly form the basis for this deep passion for the dark fantastic monochromatic figures that seem to have escaped from dreams and evoke an almost steampunk style or Gothic atmosphere. Its greatest merit lies in the fact that he brings morbid fascinations and the metaphysical mysteries that lives in human life since the dawn of time, to a modern decor without sacrificing the essence of the mystery. Thanks to 3D technology he is the perfect digital sculptor who creates his visions and lets us share in the vices of the unknown. 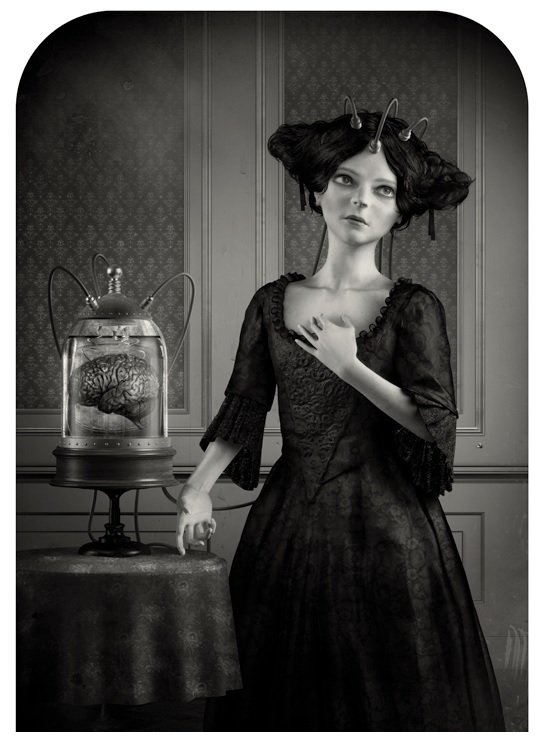 His digital paintings also breathe the perfume of a sort of mystical veil that hangs over his art, they are as powerful as the sculptures in all respects. It is not surprising that this is a time consuming process from intellectual conception to actual art. Danny van Ryswyk in my opinion, is an artist who not only subliminal inserts messages in his art, but also in the package. 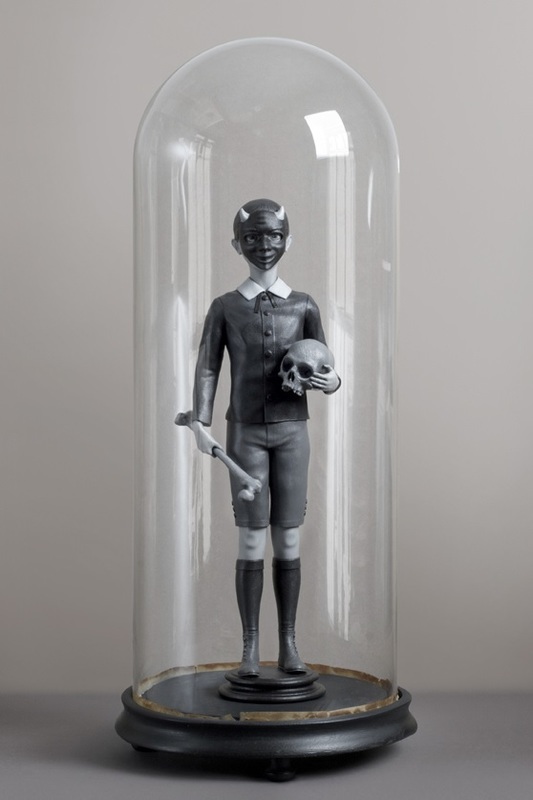 Placing his sculptures in vintage bell jars can be a reference to the pseudo-scientific methods they used in Victorian times to explain the unexplainable or give a certain explanatory cachet. The paranormal aspect of his art is not only inspiration but also clear motive. As an excellent magician, he gives a glimpse of insight into his fantasy world without opening Pandora's box to reveal all its secrets. See a work of Danny van Ryswyk is always a bit of a mental puzzle, sometimes with frustration but eventually obtaining an unique perception. 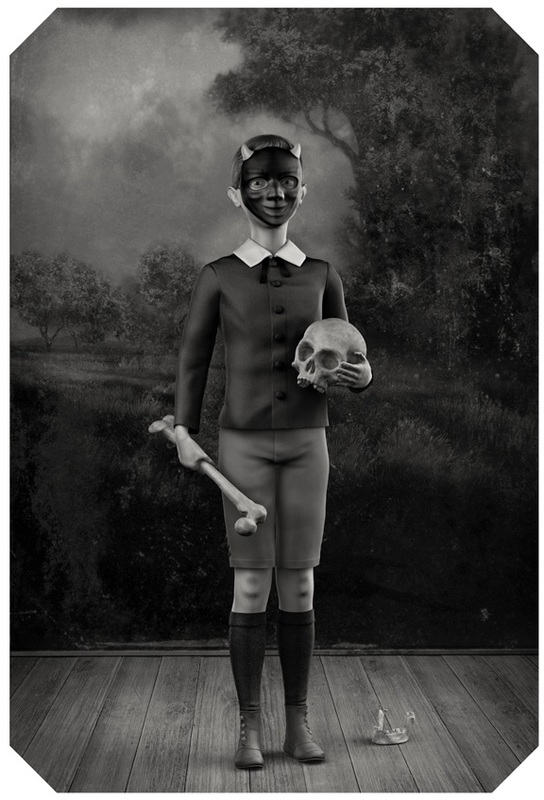 The work of Danny van Ryswyk is in all respects a discovery, because besides the fact his art touches the spectator’s emotion, it makes you think about the dark side of ourselves, religion and life. Sculpture size: 38 cm / 15" | w/Antique Glass Dome: 55 cm / 21.7"
Acrylic Paint on Polyamide 3D Printed Sculpture w/Glass Case/ Edition of 3. Sprinkled with holy water by an old blind priest. 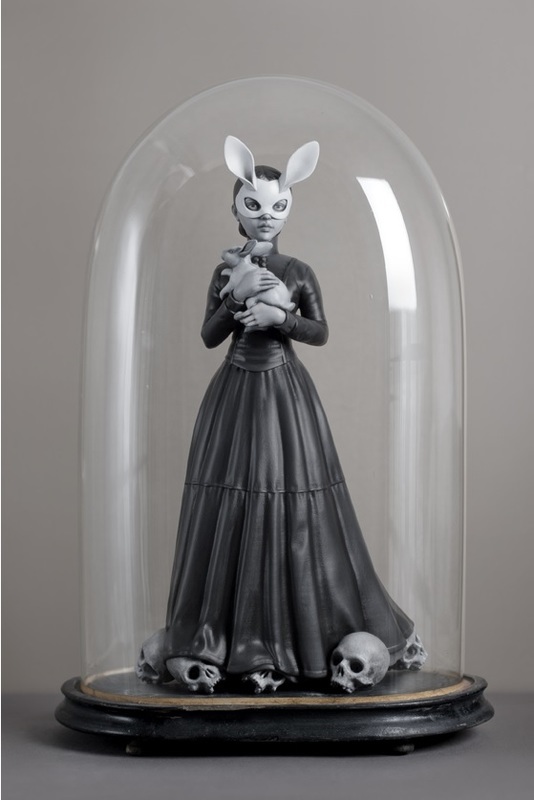 Acrylic Paint on Polyamide 3D Printed Sculpture w/Glass Dome/ Edition of 3. 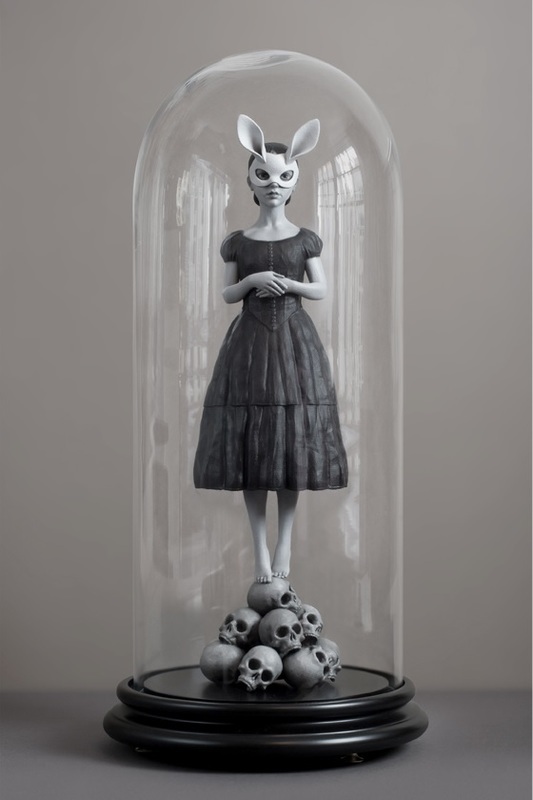 Sculpture size: 35 cm / 13.8" | w/Glass Dome: 44 cm / 17.3"
Archival Pigment Print on Hahnemuhle Photo Rag Baryta paper, limited edition signed and numbered. Image size: 29.7 x 21 cm / 11.7" x 8.3" | matted & framed: 53 x 43 cm / 21" x 17"
Archival Pigment Print on Hahnemuhle Photo Rag Baryta paper, signed and numbered / Edition of 12. Image size: 16 x 20.35 cm / 6.3" x 8" | matted & framed: 43 x 33 cm / 17" x 13"
Archival Pigment Print on Hahnemuhle Photo Rag Baryta paper, signed and numbered / Edition of 20. Image size: 31,5 x 31,5 cm / 12.4" x 12.4" | framed:45 cm x 45 cm / 17,7" x 17,7"
Image size: 37.5 x 32 cm / 14.8" x 12.6" | framed: 63 x 53 cm / 24.8" x 20.8"
Image size: 30 x 21.4 cm / 11.8" x 8.4" | framed: 53 x 43 cm / 21" x 17"